Many marine creatures feed on tiny things found in the water. Others process sand and sediments for tiny bits of nutrients. The way an animal feeds can be deduced from its body structure. Animals on our shores eat things which might appear strange to us. And have equally strange, but ingenious, ways to get their food. Delicious detritus: Detritus is a polite word for dung and decaying matter. Detritus is made up mostly of dead plants and tiny animals that have broken down into bits. Detritus is a rich source of nutrients much like fertiliser in a garden. 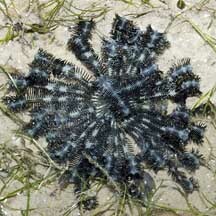 Living animals contribute detritus when they deposit dung or drop off parts of their body such as feathers and skin. Yummy Plankton: Tiny plankton is another popular food item. Plankton refers to all animals that drift in the ocean. While a few can be enormous (like jellyfishes), most plankton are microscopic plants and animals that drift with the water currents. This includes algae such as diatoms as well as the tiny larvae of larger animals. Microscopic larvae drift with the currents to disperse to new places where they settle down and grow into large adults. Most however, never make it to adulthood as they are eaten by plankton feeders. Plankton also comprises animals that remain microscopic all their lives, such as this copepod on the right. How to eat plankton? 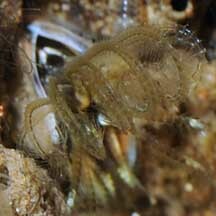 There are two main ways to eat detritus and plankton: deposit feeding and suspension feeding. Deposit feeders collect the particles that settle on the sea bottom. 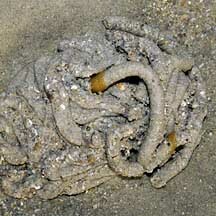 Buried worms gather detritus from the surface with their tentacles. 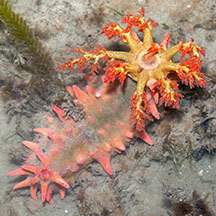 Sea cucumbers swallow and process sediments for detritus. Suspension feeders collect the bits suspended in the water. 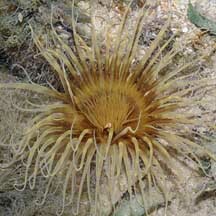 Peacock anemones use their tentacles to collect detritus suspended in the water. Filter feeders are suspension feeders that collect bits suspended in the water by actively creating a current of water through their bodies or by using body parts as a sieve. Barnacles filter the water with their feathery feet, kicking the edible bits into their mouths. Sponges and clams filter feed by sucking water into their bodies and then sieving out the edible particles. �Normal� diets: Many animals on our shores have diets that are less strange to us. Carnivores are flesh-eating animals. There are two main types of flesh-eaters: predators and scavengers. Predators actively hunt, kill and eat animals. Predators don't have to be large. An example of a small predator is the Drill, a snail that eats barnacles. Scavengers don't hunt or kill. They simply eat any animals that are already dead. Scavengers include crabs and prawns. Herbivores eat plants. On our shores, the plants are not huge trees but are seagrasses, seaweeds and smaller algae. Animals large and small munch on these plants. These include slugs and fishes. Omnivores eat both plants and animals. They usually eat a wide variety of food. We are omnivores! Feeding tentacles of a sea cucumber. from the water with their feathery arms. edible bits from the water. 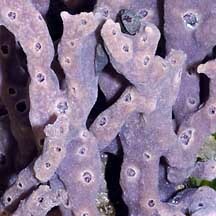 Sponges generate a current of water through the porous body to extract tiny edible bits. bits, producing coils of processed sand. the water with their tentacles. Marine Invertebrates in the Plankton on the University of Washington website: about plankton with photos of the various types of plankton including larval stages of various marine invertebrates. Photos of a wide variety of plankton on Image Quest 3-D Marine Library. Feeding on Life on Australian Seashores by Keith Davey on the Marine Education Society of Australia website: a fabulous goldmine of a site which covers various kinds of intertidal habitats and their inhabitants. Fact sheet with details and diagrams of the different ways of feeding, as well as explanation of food chains. FREE photos of marine life feeding. Make your own badge here.